After two months trapped in the frozen world of the Unfaih, Sloane has returned to Aeris with a chilling warning. Her people must abandon their seemingly perfect new world because of a horrifying evil that threatens to destroy them all. Allowing her people to stay on Aeris will doom everyone she cares about and break her promise to Rhyn. But the one person she needs to convince is the man she despises most—her father. And for reasons unknown to Sloane, he refuses to heed her warning. Her only hope is to journey deep into the icy world she escaped from, to the very source of the evil that threatens everyone she loves. She will have to use all the tools in her arsenal if she hopes to succeed, including lying to the man she struggled to leave behind. 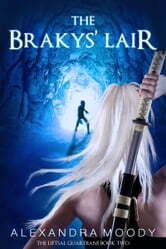 Continue Sloane and Rhyn’s story in the thrilling second book in The Liftsal Guardians series.